RAMSTEIN AIR BASE, Ger­many, Aug. 17, 2010 — Two C-130J Super Her­cules trans­port air­craft flew mis­sions from here into Rus­sia on Aug. 13, deliv­er­ing fire­fight­ing sup­plies promised by Pres­i­dent Barack Oba­ma to aid in the bat­tle against ram­pant wild­fires. Mil­i­tary mem­bers load fire­fight­ing equip­ment and human­i­tar­i­an sup­plies on to a C-130J Super Her­cules at Trond­heim Air­port, Nor­way, Aug. 14, 2010, for deliv­ery to Moscow. After an offi­cial request from the Russ­ian gov­ern­ment and at the request of the State Depart­ment, Defense Depart­ment offi­cials direct­ed U.S. Euro­pean Com­mand to pro­vide fire­fight­ing equip­ment to help Rus­sia com­bat ongo­ing wild­fires. U.S. Army pho­to by Staff Sgt. 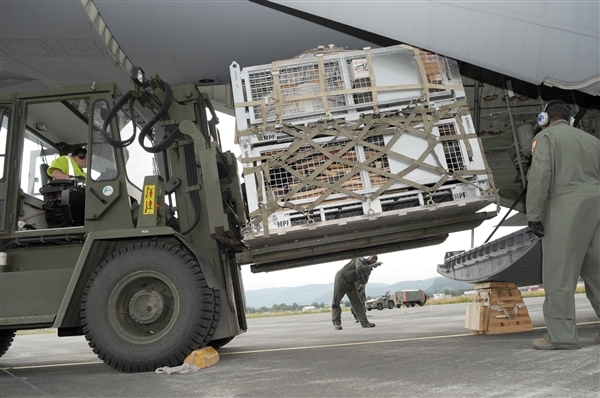 Lawree R. Wash­ing­ton Jr.
Mem­bers of the 37th Air­lift Squadron deliv­ered equip­ment from Army, Air Force, Marine Corps and Navy units through­out U.S. Euro­pean Com­mand. Eucom offi­cials began brain­storm­ing about a week before the oper­a­tion on how the com­mand could help after the Russ­ian gov­ern­ment for­ward­ed a list of equip­ment they need­ed to offi­cials at the U.S. embassy in Moscow. “Our smart plan­ners worked with all of our com­po­nents in Europe to rapid­ly deter­mine what we could sup­ply,” said Air Force Maj. Gen. Harold Moul­ton, Eucom’s oper­a­tions direc­tor. “We iden­ti­fied sup­plies like Pio­neer Equip­ment, large-diam­e­ter hoses, mobile pump­ing sta­tions, per­son­al pro­tec­tive equip­ment and med­ical kits, and then pack­aged them for deliv­ery. The U.S. response to the Russ­ian wild­fires was a quick­ly pushed mis­sion, and crews were ready to spring into action, said Air Force Lt. Col. Tobias Ser­nel, 37th Air­lift Squadron and mis­sion com­man­der. “Sup­port from the embassy in Moscow made it pos­si­ble to get our crews and equip­ment up in the air in incred­i­ble time,” Ser­nel said.